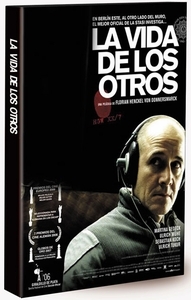 The Lives of Others (original title in German: Das Leben der Anderen) is an Academy Award-winning German film, marking the feature film debut of writer and director Florian Henckel von Donnersmarck. East Berlin, November 1984. Five years before its downfall, the former East-German government ensured its claim to power with a ruthless system of control and surveillance. Party-loyalist Captain Gerd Wiesler hopes to boost his career when given the job of collecting evidence against the playwright Georg Dreyman and his girlfriend, the celebrated theater actress Christa-Maria Sieland. After all, the "operation" is backed by the highest political circles. What he didn't anticipate, however, was that submerging oneself into the world of the target also changes the surveillance agent. The immersion in the lives of others--in love, literature, free thinking and speech--makes Wiesler acutely aware of the meagerness of his own existence and opens to him a completely new way of life which he has ever more trouble resisting. But the system, once started, cannot be stopped. A dangerous game has begun.